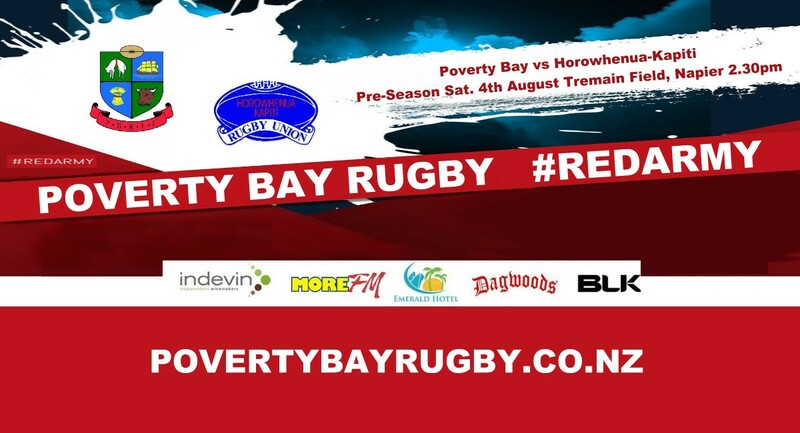 They need hard games and that’s what Poverty Bay got in their 37-14 loss to Horowhenua-Kapiti in Napier on Saturday. “We were fortunate to have had such a physical game. Both teams got a lot out of it,” Poverty Bay head coach Mana Otai said of the Heartland Championship warm-up clash. Otai was impressed with the 100 percent effort of all three Bay hookers on the day — captain Tamanui Hill, Shayde Skudder and Rikki Terekia. “Despite having to manage a neck and shoulder injury in the past month and not being able to train in contact situations until last Thursday night, Terekia came through the last 10 minutes of the game unscathed. Hill was impressed with the strength of Bay locks Micaiah Torrance-Read and Jacob Cook at lineout time. “Horowhenua-Kapiti are a strong team — Meads Cup finalists last year,” Hill said. “The weather forced both teams to keep things fairly tight, although both sides can — and did — go wide. First five-eighth Ethan Reti, on debut, converted and in the 15th minute grabbed the first of his two tries, also converting the second to put the ’Nua 14-0 ahead. In the 23rd minute, first-five Andrew Tauatevalu scored Poverty Bay’s first try and kicked the conversion to close it to 14-7. Reserve No.8, Callum McDonald, crossed for the Bay’s second try in the 35th minute, and Tauatevalu converted to close it to 21-14. Reti kicked the first of three penalty goals to give Horowhenua-Kapiti a 24-14 lead at halftime. Reti added a second penalty eight minutes into the second spell; halfback and player of the day Tainui Brown scored in the 68th minute, which Reti converted, then finished the scoring with a 77th minute penalty. The discipline from both teams under Bay of Plenty referee Sam Fellows was excellent, with no cards being given. Three players debuted for the Bay, although the match does not count as an official “cap”. The three were starting right wing Tom Iosefo, Matt Raleigh, who came on for left wing Korey Love, and Mapa Tuipulotu, who replaced second-five Anthony Karauria..
Horowhenua-Kapiti captain and blindside flanker Aaron Lahmert — deputising for injured lock Ryan Shelford — was rapt with their performance and that of their debutants. “We stuck to our game plan — exiting in our zones, taking points when they were on offer and then returning straight away to their end,” Lahmert said. From a Bay perspective, the hard yards and resilience stored away could bear fruit when grit is called for in close games. “The process of forming combinations is ongoing,” said Otai. The Bay play the Hawke’s Bay Saracens at 2.30pm on the same ground this Saturday — their last warm-up game before the Heartland Championship starts with a home game against Wairarapa-Bush at Rugby Park on August 25.